Why chase down clients to pay you by check when you can get paid faster via credit card? You might need to raise your prices a bit to build in the merchant services provider transaction fees, but it adds a great deal of convenience and time saving. 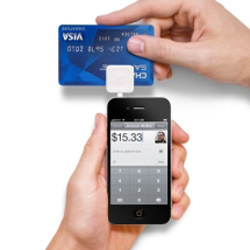 These services give you an advantage to get paid faster via your smartphone or tablet device. These service providers give you a free card reader. The card swipe rate versus the keyed rate varies, somewhere between 2.70% – 3.70%. Generally it’s cheaper to swipe than key in the card number, so factor that into whether you collect money in person versus over the phone. Definitely read the fine print about what types of cards/conditions apply, especially with Intuit. The account setup is pretty easy. You’ll need to connect your account to an existing bank account so you’ll eventually be able to transfer funds to your bank. Again, definitely read the respective FAQs and fine print about how much and how soon you can transfer funds. Have you been wanting to add buttons (i.e., Buy, Add To Cart, Donate) to your web pages? Accepting credit cards online can be a bit complicated, depending on what functionality you need. If you consider yourself to be DIY type, you should be able to make one of these solutions work for you. Otherwise, if you need more functionality/complexity, a good web developer should be able to configure one of these solutions for you. Again, transaction fees may vary, so check out the pricing and help sections first. PayPal is basically 2.90% + $0.30 on each transaction. If you expect higher monthly volumes, different plans/tiers can reduce the per transaction fees. PayPal and Google Checkout are only two possible solutions. There are many more. I only highlighted them because they are relatively easy for a do-it-yourself small business owner/entrepreneur. Keep in mind that if you accept credit card information, you must take the security of that information very seriously. You must keep it safe. Best is to properly destroy the info as soon as you no longer need it, or not store it long-term at all. You should also investigate the security policies of any merchant service transaction providers before you create your account with them. Finally, remember physical security. Keep your smartphone/tablet locked when not in use. Log out of the Square/Intuit smartphone apps. Same goes for the web browser versions of those services. Please share your experience or suggestions in the comments below. *DISCLOSURE: Some links to third-party websites may be affiliate links. We may receive compensation if you click on an affiliate link and register with that service provider.